We all know that a useful and productive meeting can be a huge boost to creative thinking and business growth. But there are also ways that you can spread out your contact over the week to ensure that you communicate efficiently with members in your team. One of these ways is by having a short daily stand-up meeting to discuss priorities, questions, and any possibilities for collaboration. More and more companies are using this simple technique to avoid long and arduous meetings and get more out of their day. 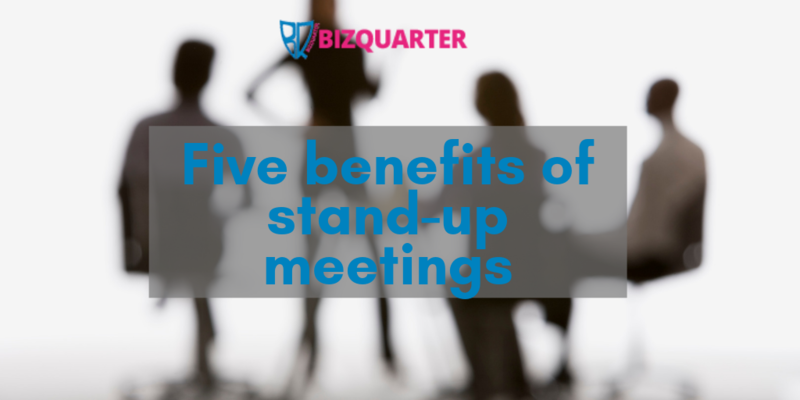 In this blog, we are going to be looking at 5 key benefits of stand-up meetings. It may seem trivial and obvious, but the stand-up element of a stand-up meeting is probably one of the most important. The simple fact that people are standing around means that you are constantly aware of how long the meeting is taking. There’s nothing more boring and sleep-inducing, than a hot and stuffy meeting room with comfy chairs to relax into. The average stand-up meeting should be about 5-10 minutes, which means that you can rattle through the most important points without eating into your day too much. Keep it short and sweet, and your participants will always know what is going on without needing to organise long weekly meetings. We all need that reminder or that little push of accountability sometimes. A stand-up meeting is a great way to introduce an element of ownership into your team or company. If on Monday, you commit to finishing a certain campaign or piece of work, then you will have to answer to that on Tuesday. If anything, it allows you to build up an awareness of what everyone is responsible for, which will help motivate them when it comes to finishing tasks. Team morale is crucial to forging good working relationships between co-workers. Stand-up meetings can help create a platform for an informal forum where everyone is on a level playing field, which opens up the conversation to everyone. This can help people feel like they are a valuable part of the team which boosts productivity. More than anything, a frequent stand-up meeting is a great way of increasing awareness. Sometimes, it’s hard to remember who is responsible for what tasks. It’s easy to get lost in your own little world of due dates and deadlines. With a stand-up meeting, however, you are constantly aware of what everyone else is working on. That way, you can jump in and help wherever necessary. You may also find that this stimulates more of a collaborative environment within your office. It also means you, or anyone else, can flag larger issues that can then be discussed and addressed as a team at a later date. Everyone knows that meeting rooms are hard to come by these days. A large portion of managers and executives alike confess to sometimes spending hours a week looking for suitable venues and rooms to organise their meetings. It’s one of the biggest wastes of time and it’s frustrating and unproductive. With a stand-up meeting, all you need to do is find a relatively quiet space and you’re ready to go! It’s also important to move around the office and stay active, even if you are predominantly working at a desk. If you are looking for a suitable meeting room solution in Glasgow to organise your standard meetings or monthly reviews, then please use Bizquarter’s intuitive and easy-to-use booking calendar to book an available slot.